NHL Realignment: Third Time is a Charm? Clearly, realignment is no easy task for any professional sports league. Inevitably, some teams will be at a traveling disadvantage due to their geographic location. The Arizona Cardinals, for example, once played in the NFC East; the Atlanta Braves once called the NL West home. Simply put, there is no way for any league to keep all of its teams completely happy with the division in which they play. The NHL, however, faces some unique challenges compared to other leagues, especially now. With nearly one quarter of its franchises located in Canada, the league must deal with divisional travel challenges that are not faced by the other major sports. Throw in the debacle that is the Phoenix Coyotes ownership situation and producing a successful long-term realignment plan will prove to be quite a challenge. That being said, the NHL’s new realignment plan is laughable, at best. 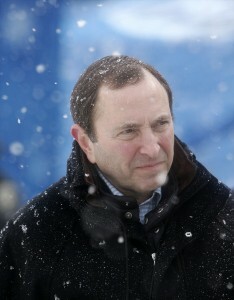 Surely, this can’t be Gary Bettman and the league’s best effort. While they did address NHLPA concerns regarding how teams would qualify for the playoffs with a sort of wild card system in an effort to ensure the best teams would make the post-season, there are still several issues with the new plan. For starters, the breakdown consists of 16 teams in the East and 14 in the West. Obviously, this creates a slight imbalance for the chances of teams to have an equal shot at a post-season berth. This may not be a huge concern for present purposes but, should the Coyotes relocate to the East (to Quebec City, for example), the NHL will find itself in a similar situation that it faces now with Winnipeg playing in the South East division. Worse yet, without some other sort of realignment, it could lead to 17 teams in the East versus 13 in the West. Surely the league doesn’t want to tinker with the divisions again in the next few years. Is it perfect? Clearly, it is not. A team like Detroit, for example will likely be disappointed to still find itself in the West. However, this plan groups teams a little more closely from both geographic and time-zone standpoints while still maintaining the majority of the rivalries throughout the league. Furthermore, should Phoenix move to the East, the plan is built to allow a smoother transition. Should the Coyotes end up in a place like Quebec City or Hamilton, they could either simply move to the Central (not ideal but manageable) or a team like Toronto could slide to the Central and the Coyotes could take their place in the Northeast. This would keep the competitive balance even with 15 teams in each conference without introducing yet another realignment in the coming years. Again, the key here is to minimize the damage for everyone involved. And that is something the NHL should be very interested in after the past year.